These books excite me a lot and the idea of getting to share these books with others who may just love them as much as I do is even more exciting. As you may know, I made a list of my Top 10 Favorite Books of 2017, one winner will get to choose from those ten books! I'm trying to focus more on these ten books, but if for some reason or another you would prefer one of the honorable mentions from that list, maybe you've already read all of these books, or maybe you have your heart set on one of those, I can bend. However, I really would prefer to stick to these ten. International as long as Bookdepository ships to you. For me it's always hard to pick just one book, but the one that made the most impact in the previous year was definitely The Hate U Give by Angie Thomas. Amazing read! Not entirely sure which book I would pick, I guess it would be either A Court of Wings and Ruin or Everything Everything. Thank you so much for the giveaway, it's so nice of you! I think I'd choose Lord of Shadows, because it was incredibly entertaining, but you've presented us with a hard choice indeed, that's a fantastic list you've got there. My favorite reads were ACOWAR, Tower of Dawn and Caraval. And I would pick Lord of Shadows. Thanks for the chance. My favorite book read in 2017 was The Hate U Give. It's perfect, and I think everybody should read it! 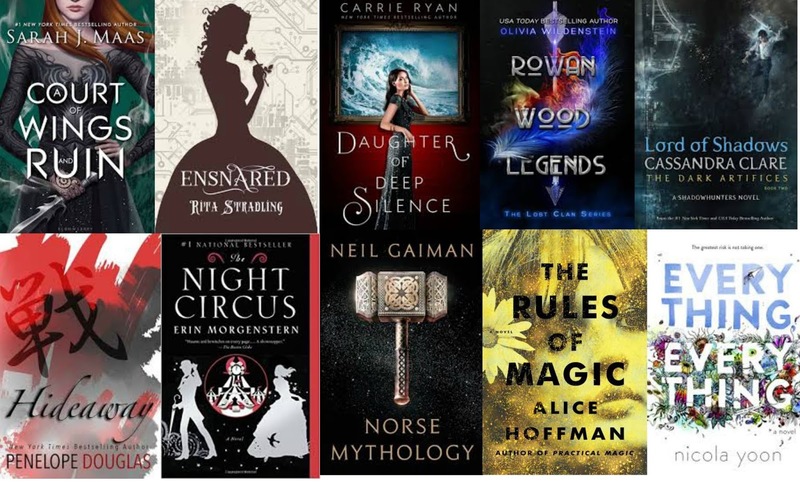 And I would pick either ACOWAR or The Night Circus! Thank you for the giveaway!! Happy 2018!!! I adored the two Illuminae books that I read last year. They are hands down my fave of last year. But second comes all the amazing Neil Gaimon books I read. My favourite book released in 2017 was A list of cages by Robin Roe. I also loved the 2 first books in the illuminae files trilogy and the blood for blood trilogy by Catherine Doyle Everything, everything was also one of my favourite reads last year. Six of Crows was my best read of 2017. I would like to take The Night Circus if I win. I have been dying to get my hands on a copy. My favorite book last year was Queen Maas' A Court of Wings and Ruin :D It was one of the most amazing and breath-taking masterpieces that I have the chance to read T_T And if ever I win, I would choose Tower of Dawn. Another masterpiece of Queen Maas. Awesome giveaway! I would choose the night circus because I've wanted to read it for the longest time! But I'm trying to get through some unread books before I buy anymore so it's been a while since I treated myself.